Guests will be gathering at either Kabukicho Police Station or in front of Cocoon Tower at Shinjuku Station West Exit. We will then depart and take Shuto Expressway, followed by Tomei Expressway and head towards Hakone after a short break at Hiratsuka SA. Upon arrival in Hakone, the elegant Lake Ashinoko will first come into sight. Lake Ashinoko and its surrounds is a resort area including grand lakes, magnificent Mt. Fuji, sightseeing boat and ropeway, as well as both Japanese and western style hotels. Here Hakone Sekisho and Shrine are regarded as the foremost historical sites and power spots in Kanto. Pirate Ship tour is operated between Motohakone and Togendai Port. There are three types of Pirate Ships: Vasa modeled after the Vasa warship built by King of Sweden in 17th century, Victory after the prototype of English iconic warship from 18th century, and lastly Royal Louis modeled after 18th century French Navy’s flagship. It is possible to come out to the deck of Pirate Ship for the enthralling view of Mt. Fuji! However this ship tour may be not operated due to bad weather, and be replaced by a visit to Hakone Sekisho. Next we will have all-you-can-eat Shabu-shabu lunch with various options of fresh ingredients. 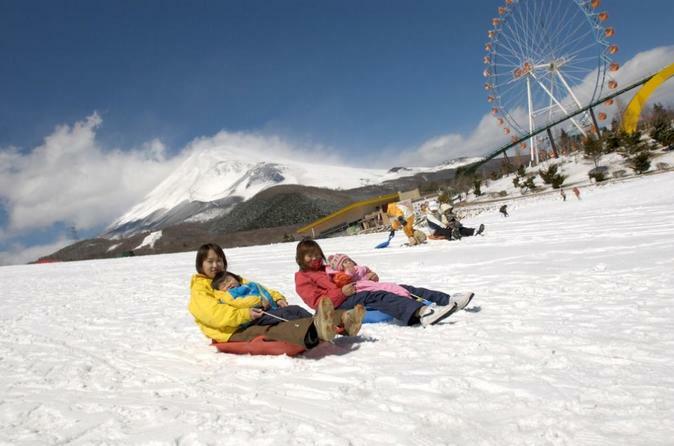 After lunch it will be time to enjoy snow sledding at theme park Grinpa or Yeti located at Mt. Fuji 2nd Station. It is not necessary to equip with ski gear but casual outfit. Please make a satisfying experience while sledding down at a cheerful speed and with Mt. Fuji as background! Final stop of this tour will be one of the most popular outlets Gotemba Outlet for shopping. Owning about 210 stores selling both Japanese and international brands, this outlet is Japan’s largest outlet. Coupon with 5～15％ discount will be given to our guests. There is also food court to take rest and reenergize with breathtaking view of Mt. Fuji close at hand. We will return to Shinjuku Station West Exit as end of this tour.